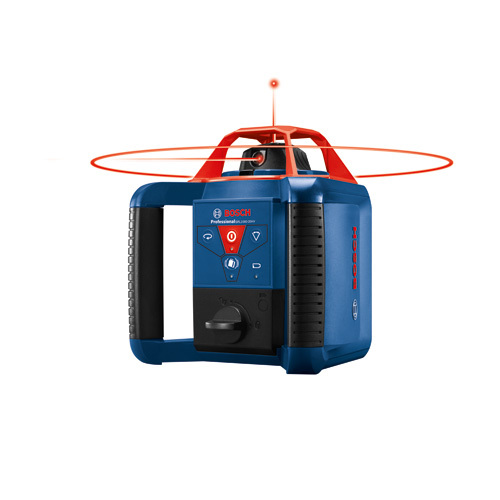 The Bosch GRL1000-20HVK Self-Leveling Rotary Laser Kit delivers a comprehensive solution for precise outdoor and indoor leveling. It features a horizontal/vertical self-leveling laser, suitable for leveling, aligning and squaring applications. The rotary laser provides users with variable speed selection and manual scan angles for maximum visibility at different lighting conditions. It delivers accuracy of up to ±1/8 In. at 100 Ft, and a range of up to 1,000 Ft. with LR10 laser receiver. The electronic self-leveling system has a disturbance monitor, which indicates to the user if tool position changes, ensuring consistent leveling accuracy on the jobsite. The laser has a metal cage and an IP54 rating. Easy to use, the kit includes a remote control that allows for one-person operation to handle leveling and grading tasks on the jobsite. This all-in-one solution includes a laser receiver, remote control, aluminum tripod, sturdy grade rod and hard carrying case.